How many employees do we have? What makes our company unique? 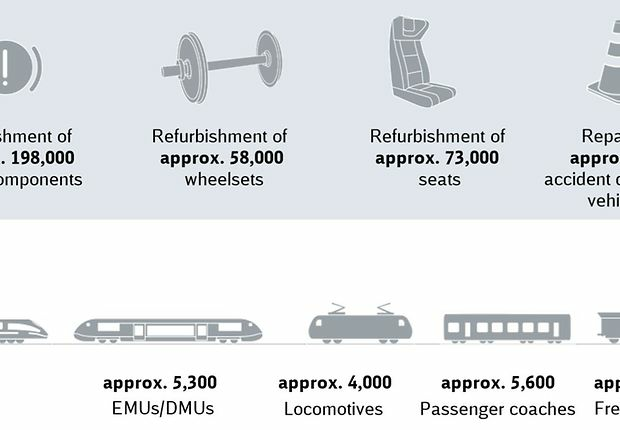 What types of trains did we maintain in 2017? Read here to find out more. Our clients stand at the heart of our efforts. We see our customer as partners. Together we have extensive knowledge of all kinds of vehicles that is sought after by Deutsche Bahn and other companies. Providing good service is essential to us. Read our company strategy to find out more. wheelsets is a major component of our full service Portfolio. Multiple unit, railcar, locomotive, high-speed transport, passenger transport, freight transport – you name it. We are the maintenance specialist for all vehicle categories. *Figures rounded per calendar year. Figures relate to the year 2017.